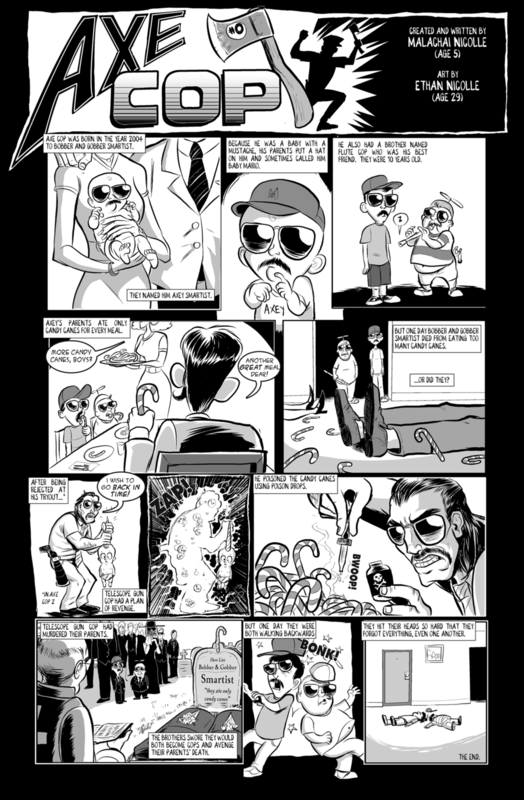 This is the famous webcomic, Axe Cop. It began in 2009 when Ethan Nicolle started adapting the strange yet hilarious imagination of his 5 year old brother, Malachi Nicolle, into a very well produced webcomic series. The webcomic's premise is simple. There's a cop who wields an axe as his preferred weapon. 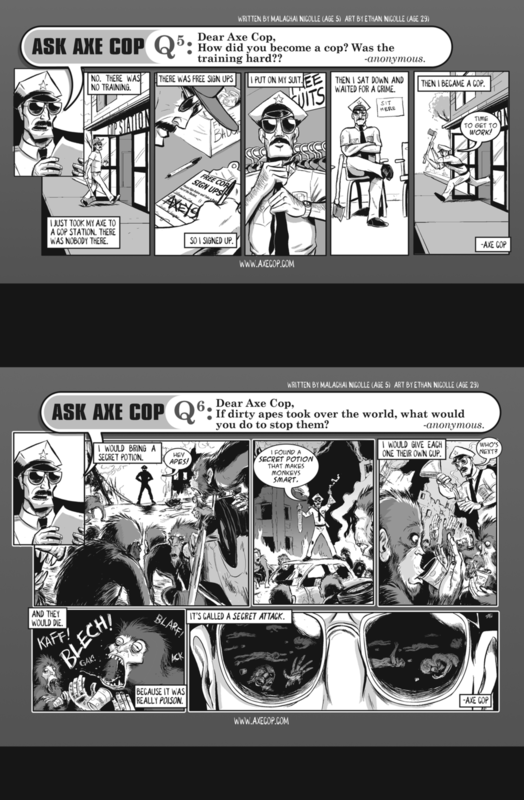 Henceforth, his name is Axe Cop. The nomenclature actually runs along that line for pretty much every other character (all of them also impossibly eccentric) in the webcomic. Like flute cop, who plays the flute. Or avocado soldier, who's an avocado (who also used to be flute cop before he ate an avocado and turned into a big avocado). As you would guess from a 5 year old's storytelling, nothing about this makes any sense, and the rather serious tone of Ethan's art adds to the fun, which is what was probably intended. And that's the point with this comic. You just have to let it all go, and simply accept what is going on. Open your mind, and let yourself be dazzled by the force of nature that is Axe Cop. I mean, what's not to like about this webcomic? Axe Cop is basically just a wild roller coaster ride. You literally have no clue as to how this webcomic will go. Nothing is ever predictable, and everything goes, quite literally. Oh and did we also mention, this is the same Ethan Nicolle who did Bearmageddon, and between the two, Bearmageddon's the more 'toned down' one. 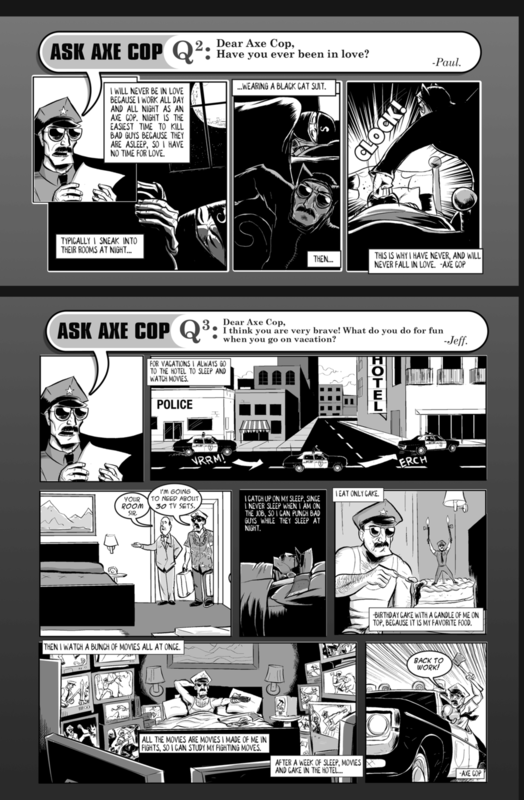 So you kind of get the picture of what you might be getting into when you start reading Axe Cop.